" Source London, which will deliver 1,300 public charging points across London by 2013, is part of the Mayor’s plans for London to become the electric vehicle capital of Europe. The Source London network will create a single visual identity for electric driving across the capital, and allow members to charge their vehicles at any one of these public charging points. "It is fantastic news that Londoners are now starting to get their hands on an exciting new generation of electric cars such as the i-MiEV. In April I am launching Source London to make electric driving more convenient and to make charge points easier to access." "An increase in electric vehicles is great news for everyone because they bring a host of environmental benefits including helping to reduce pollution. But they are also offer drivers due significant cost savings on running costs, including a 100 per cent congestion charge discount." Annual membership of the scheme is ￡100, enabling cardholders to charge up at any Source London point whenever they need to. 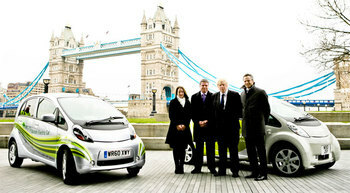 The scheme initially launches with 150 new charge points making it London’s largest single charging network. 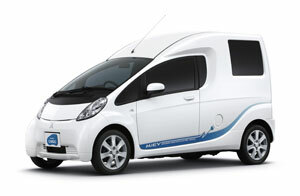 "Derived from the production i-MiEV, this concept maximises the outstanding environmental performance and economic efficiency characteristics that define the EV and at the same time adds a generous amount of rear free space to extend the range of uses to which it can be put by corporate users and self-employed operators in particular. Measuring 1350 mm wide by 1180 mm deep and 1100 mm high and having a flat floor, the cube-shaped luggage compartment at the rear of the vehicle allows every inch of available space to be utilised. The height of the compartment floor has been designed to facilitate loading and unloading of luggage and make it more user-friendly.